Way back in February of 2013, Sony indicated that the PS4 gamers would be able to put their console in sleep mode while playing a game and briskly return to it later. They also said that gamers could enlist a friend to take over a game via the Internet from another PS4. The PS4 currently does neither of these things. Scuttled features? No, says Sony. "Our team has been working on it," Sony's head of worldwide studios, Shuhei Yoshida, told me last week when I asked, first, about the friend-takes-over-your-game feature. "There are some things that we announced in February of last year that were not planned for the launch timeframe." He said the suspend feature is in the same category. "It's not ready yet," he said. And when will either be ready? "I am asking the same question to my tech team every other week. Because every day I get reminded by lots of people: 'Where is this? Where is that?' It's a great reminder for me." PS4 radically reduces the lag time between players and their content. 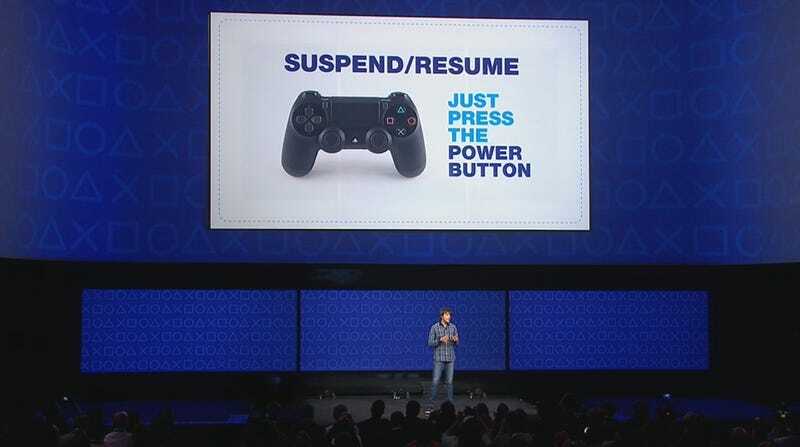 PS4 features "suspend mode" which keeps the system in a low power state while preserving the game session. The time it takes today to boot a console and load a saved game will be a thing of the past. With PS4, gamers just hit the power button again and are promptly back playing the game at the exact point where they left off. Your friends can actually look over your shoulder virtually and interact with you while you're playing; and if you allow them, your friends can also post comments to your screen; you can solicit support from them, or you can just trash-talk with them. (...) You can ask your friend on the internet who's finished that game, to take over your controller and assist. We're building this capability into the PS4 and the PlayStation Network. Last October, just a couple of weeks before the PS4 launched, Sony noted that some of the February 2013-promised features wouldn't be available on day one. Six months later, they still appear to be in the works with no timeframe to speak of. The next big feature coming to PS4, though, seems to be backwards compatibility. That will arrive via the PlayStation Now streaming service, which is in beta now and will officially launch into open beta on PS4 on July 31. A few other PS4 odds and ends: During our conversation about PS4, Yoshida also talked about the relative lack of big Sony-published games slated for Sony's console this fall. Driveclub and LittleBigPlanet 3 are coming, and an even-more-HD edition of the acclaimed The Last of Us will be out by then, but that's not exactly a full line-up of blockbuster, so-called AAA games. "We've been saying that the number of AAAs might be getting smaller because the cost of development for AAAs is getting higher," he said. "But there are so many indie games and great games coming out almost every week or every other week. We're seeing it on PS4. I hope you're seeing it as well." Yoshida is very excited about LBP3, which he said would not just support all of the user-created levels from earlier console games in the series, but display them in higher 1080p resolutions...and would let them run with LBP3's new, tighter, less floaty jump mechanics. To contact the author of this post, write to stephentotilo@kotaku.com or find him on Twitter @stephentotilo. Top image from the 2013 PS4 reveal event, screencap via NeoGAF.